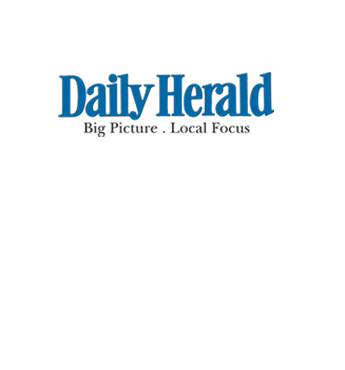 Heights, now lives in Chicago. With two of their three sons out of the nest, the homeowners at first thought of moving to another house that would better meet their needs. But after a long and frustrating search, the couple opted to stay put. Essentially, they still loved the house where they’d lived for 18 years, never tiring of the wooded terrain and the creek that meanders quietly behind it. The site belies the fact that it’s within blocks of heavily traveled roads and massive shopping malls. The builder they’d asked to help with some remolding and updating in the 4000-square-foot house suggested Wiltgen as a source for efficient space planning and design ideas. The first step involved converting the former garage into an elegant kitchen. Because the couple entertains often, they wanted their new kitchen to be both efficient and beautiful. Casual gatherings are usually limited to eight guest, but the family is planning a large party to celebrate the recent engagement of one of their sons. Approximately 80 guest have been have invited. For both large and small parties, the family encourages guest to mingle freely between the kitchen, and adjacent breakfast area and their formal dining room. Because the kitchen is a frequent gathering space for both family and friends, the couple wanted it to be spectacular. Rather than putting a conventional flat ceiling in the new room, Wiltgen opted for the more architectural effect a tray ceiling provides. But when the construction was finished, the designer realized his creation was incomplete. “I knew then that we had to tie this marvelous ceiling in with the rest of the house and with the personality of the owners. We need to show her love for flowers, “says Wiltgen. 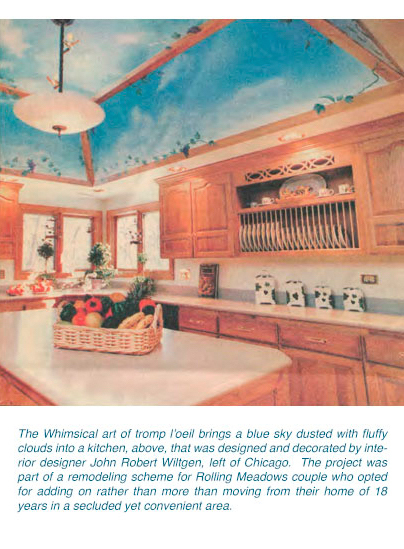 Using trompe l’oeil (a French word that means “fool-the-eye”) painting, Wiltgen designed a ceiling that tricks the eye into believing it’s a blue sky dotted with fleecy clouds. The perimeter of the sky outlined with strips that appear to be an extension of the ceiling molding above the room’s huge bank of hickory cabinets. Ivy, inspired by a huge pot the homeowner has tended for years, creeps randomly around the artistic replicas of the beams. Corian countertops, as well as an island workstation, give the room a sleek but practical appearance. The adjacent breakfast room, formerly a small kitchen includes a bay window that overlooks the wooded back yard and the creek that flows through it. The homeowner has filled the window area with pots of blooming plants, from delicate, paper white narcissi to fragrant hyacinths that add a spring like aroma to the room even during subzero temperatures that plagued the suburbs this winter. Because Wiltgen believes in using what his clients already own to best advantage, he sent their oak kitchen table out to have the color bleached from it. New rattan chairs complete the setting –Bleaching isn’t the only thing Wiltgen likes to do with tables. As a method of lightening the dining room’s mood, Wiltgen had a faux stone finish applied to the family’s dark oak dining table, fashioning decorative inserts for it of Lapis and malachite. My philosophy is that no one should buy or sell a matched set of anything. By changing the look of a table, we were able to make the room interesting,” says Wiltgen. 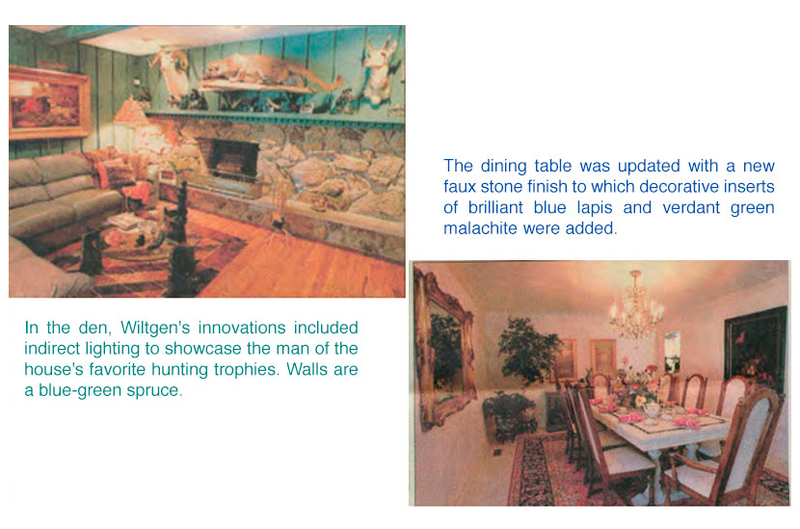 The homeowner loves not only the appearance of a very contemporary particularly her own traditional that’s in the den, Wiltgen’s innovations included indirect lighting to showcase the man of the house’s favorite hunting trophies, walls are a blue-green spruce. The dining table was updated with a new faux stone finish to which decorative inserts of brilliant blue lapis and verdant green Malachite were added piece, but the practicality of a surface that accepts hot dishes or red wine spills without danger of destruction. Walls trophies the family’s male contingents have bagged through the years. A ram and a cougar take center stage with deer and elk playing supporting roles in the room. While the couple’s oak buffet was left intact and works well for both serving and storage, Wiltgen added elegant crown molding to the walls. The dining chairs original finish also was left intact, but the seats and backs were covered in a rich white-on-white damask fabric. Wiltgen and the homeowners chose a creamy shade of patterned marble, The same material used in the foyer and hallways, for the room’s flooring and he placed an oriental rug on the floor. “The rug works as an art element, allowing the homeowner to change color schemes by using accessories and serving pieces that reflect or contrast with the blues and the reds in it, “ says Wiltgen. Moving into what the man of the house calls “his” room, Wiltgen enlivened the space by painting the walls a shade of blue-green he calls spruce. Almost instantly the dark wood paneling seemed to come alive. Wiltgen added recessed lighting to the room to showcase the mushroom-colored leather sofa brightened by gold colored silk and velvet pillows and for two floor lamps in the room, Wiltgen designed shades that are handmade entirely of pheasants feathers. While the first floor has been completed, Wiltgen is now beginning a design plan for the second floor bedrooms as well as an elegant spa that adjoins the master suite. As often happens when a family and a designer work closely together over a year or two, they forge a friendship. In this case, both husband and wife admire John Robert Wiltgen’s creative spontaneity. What Wiltgen likes about the couple is that they are open to new ideas and approaches and that they live in every room of the house. “They want the house to look beautiful and they want it to be comfortable. I enjoy working with real people who know how to live in their homes”, says Wiltgen.